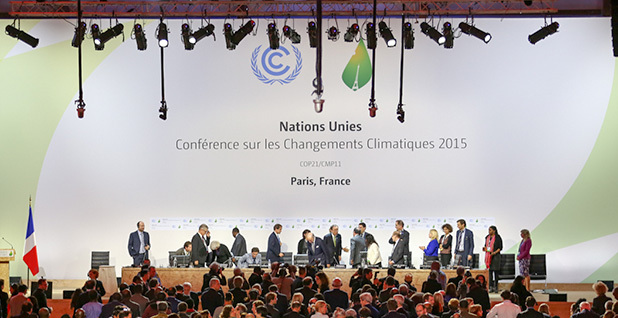 A global climate change accord calling on nearly 200 nations to make emissions cuts goes into effect this week. But will it be enough to save the planet? Photo courtesy of the U.N. Environment Programme. The U.N. Environment Programme dumped a bucket of cold water this morning on nations riding high from the Paris climate change accord's taking effect this week. In a new report, UNEP found that even if every country that made an emissions-cutting pledge in the Paris Agreement keeps its promise, the world will still fall 12 to 14 gigatons short each year of keeping temperature rise below 2 degrees Celsius over preindustrial levels. The individual commitments would only keep warming below 3 degrees at best, the report finds. Meanwhile, nations are on course to further miss the mark of the Paris Agreement's more ambitious pledge to "pursue efforts to limit the temperature increase to 1.5 Celsius above pre-industrial levels" by 15 to 17 gigatons per year. "If we don't start taking additional action now, beginning with the upcoming climate meeting in Marrakesh, we will grieve over the avoidable human tragedy. The growing numbers of climate refugees hit by hunger, poverty, illness and conflict will be a constant reminder of our failure to deliver. The science shows that we need to move much faster," UNEP chief Erik Solheim said in a statement. The annual report comes as climate diplomats prepare for two weeks of U.N. negotiations in Morocco that will be aimed at making the promises of the Paris Agreement a reality. The deal officially goes into effect tomorrow. 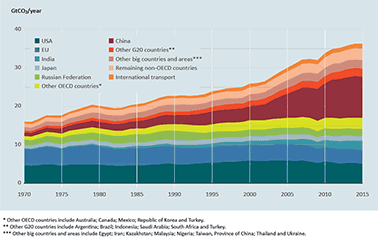 Global carbon dioxide emissions from fossil fuel combustion, cement production and other industrial processes currently account for about 68 percent of total global greenhouse gas emissions, and were estimated to be 36.2 metric gigatons of CO2 in 2015. Graph courtesy of UNEP. "Compared to the 2°C goal that was the reference point of earlier Emissions Gap Reports, these new objectives require stronger short-term action and deeper cuts in the medium and longer term, as the remaining carbon dioxide budget is now considerably lower," according to the report. Researchers said the Paris Agreement's early entrance into force signals a strong commitment from countries to address climate change — but this concern wasn't reflected in their pledges to ratchet down their emissions. "In summer 2015, all major countries had submitted INDCs [intended nationally determined contributions], and they showed in aggregate that there is a large [emissions] gap," said Niklas Höhne, a researcher at the NewClimate Institute in Germany, who was the lead author of two chapters of the UNEP report. "This insufficiency was accepted in Paris but led to several provisions in the Paris Agreement meant to encourage countries to increase their ambition level," he added in an email. "The first opportunity to raise ambition was to change the 'intended' contribution into a more ambitious final one when ratifying the Paris Agreement. But no major country has done that." The planet's current policies put it on a trajectory to emit carbon dioxide at a rate between 58 and 62 gigatons in 2030. Pledges under the Paris Agreement would bring that down to a range between 52 and 57 gigatons of carbon dioxide. Keeping the planet's temperature rise below 2 degrees Celsius would require limiting greenhouse gas emissions between 31 and 44 gigatons per year. In response, the report called for strong climate mitigation efforts before the year 2020, at which point the world will be on a warming trajectory that would be hard to reverse. This would require much stronger policies, deploying vastly more clean energy, reducing costs and coming up with new ways to cut greenhouse gases. "The large number of nationally determined contributions was only possible because renewable energy has become so cheap," Höhne said. "But also other areas see breakthroughs such as electric mobility, where the transition seems to happen faster than expected. In addition, the cost of air pollution is more and more factored into the economic evaluation and often point against coal." Philip Killeen, a research associate at the Worldwatch Institute, who was not involved with the UNEP report, noted that 2015 was a record year for the deployment of clean energy but that the pace of progress still isn't fast enough to meet climate targets (ClimateWire, Oct. 28). "We still need to double what we achieved in 2015 every year for the next 20 years," he said.